70 W INTER 2018 PracticeLink.com live & practice University Hospital, I u Health Methodist Hospital, and Riley Hospital for Children. I u Health also operates I u Health North Hospital in Carmel, a 189- bed hospital with all-private patient rooms, including private NIC u and PIC u rooms. Says Mark Clarke, a recruitment associate for I u Health Physicians, "I u Health North Hospital features maternity suites with whirlpool labor tubs, two cesarean section s u it e s c o nve n i e nt l y lo c a t e d adjacent to maternity beds, and 16 technologically advanced surgical suites with a focus on non- and minimally-invasive procedures." I u Health North Hospital provides a broad range of services, including bariatrics, neurology, obstetrics, plastic and reconstructive surgery, radiology, sports medicine and urology. Clarke is part of the 1 2 -person tea m of physicia n re c r u iters work i ng to br i ng physician talent to Indiana and specifically to Carmel. " There is a lot of growth in Carmel, especially in the city center area," says Whitney Riggs, communications coordinator at Hamilton County Tourism. "This is one of the main areas where there are a lot of new restaurants and shops. Our midtown is also in the process of growing a lot." Despite being a small town, Riggs says that Carmel has "big city things to do." In the summer, Riggs says there are scores of free concerts and events, including the popular annual Greekfest in August. "I originally lived in Indianapolis," says Beach. "My husband and I moved to Carmel a year and a half ago. We looked around and thought, 'Hey, this is a great place to have a family.' We have a 4-year-old, and we really like that it's an active community. There are great schools. It's really safe." Beach also appreciates that her work as a pediatrician helps her become better acquainted with local families. "One of the things I especially like about living and working here is that I see my patients out and about; I know their families and they get to know mine." Beach means this in more ways than one. She and her husband bought a house in Carmel, and they immediately clicked with the area. She shared with the rest of her family how much she enjoyed living in Carmel — and her brother decided to relocate there. Then, so did her parents. "My parents definitely wanted to be close to their only granddaughter," says Beach. "The area has great schools," Beach says. "The city really cares about maintaining our school system. They try to keep the city and the community really nice." 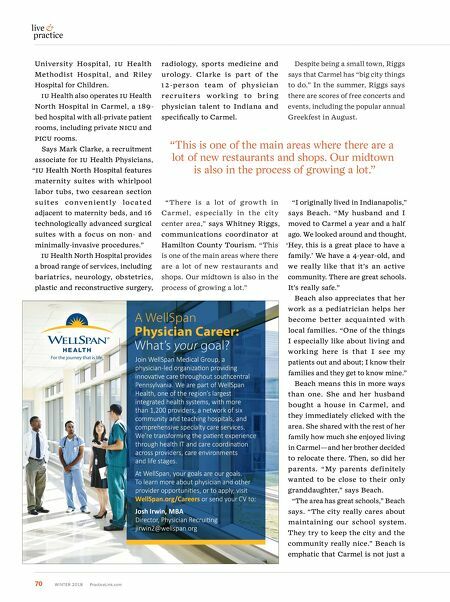 Beach is emphatic that Carmel is not just a A WellSpan Physician Career: What's your goal? Join WellSpan Medical Group, a physician-led organizaƟon providing innovaƟve care throughout southcentral Pennsylvania. We are part of WellSpan Health, one of the region's largest integrated health systems, with more than 1,200 providers, a network of six community and teaching hospitals, and comprehensive specialty care services. We're transforming the paƟent experience through health IT and care coordinaƟon across providers, care environments and life stages. At WellSpan, your goals are our goals. 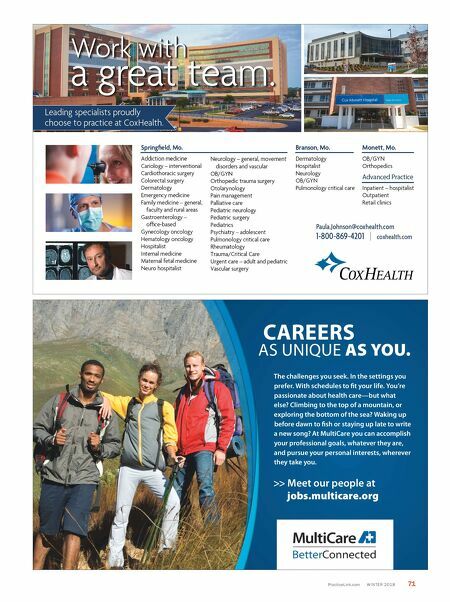 To learn more about physician and other provider opportuniƟes, or to apply, visit WellSpan.org/Careers or send your CV to: Josh Irwin, MBA Director, Physician RecruiƟng jirwin2@wellspan.org "This is one of the main areas where there are a lot of new restaurants and shops. Our midtown is also in the process of growing a lot."